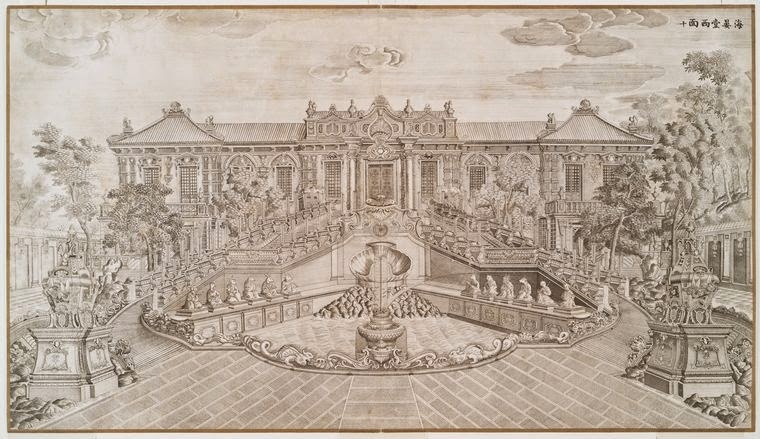 Landscape gardens were also known, especially in France, as Anglo-Chinese Gardens. 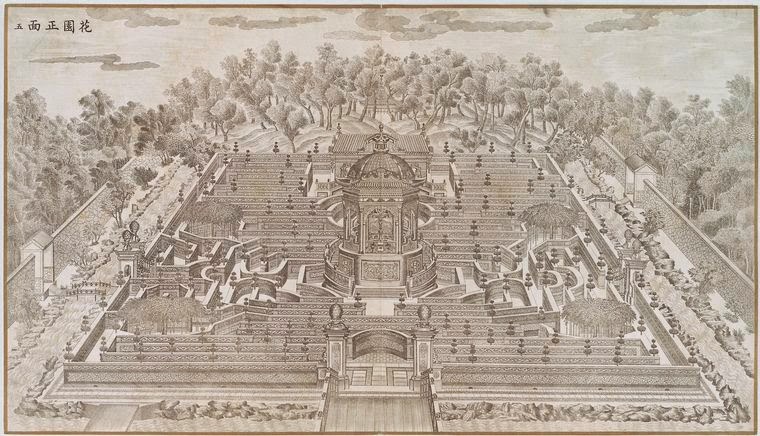 Probably the first one to use this description was Georges-Louis Le Rouge, an architect and cartographer who published, in 1775, a collection of plans and drawings titled Jardins anglo-chinois à la mode. What was the link between Landscape gardens and Chinese gardens? There are many analogies regarding the composition of space and the way to look at nature. Both styles of gardens were irregular, they seemed to most revere natural landscape, they used water not through fountains but through small rivers and lakes, masking as much as possible their artificiality. Artificial mountains give the place a natural look and brought people closer to the sky so that the garden was conceived as a series of consecutive views. In Europe, landscape gardens soon begun to use the Chinese-style buildings. The first one was probably built in Stowe in 1738, but one of the most famous is found in the Kew Gardens, and was designed by one of the most important architects and essay writers of the new garden, William Chambers. In his book A dissertation on Oriental Gardening (1772) Chambers states clearly that even if Western architecture is far superior to that of Chinese architecture, their gardens are certainly worthy of imitation. How did people know about the look of Chinese gardens in that period, since long distance travel was so rare? One of the first and most important accounts of a Chinese garden came from a French Jesuit, Jean Denis Attiret, who stayed in Beijing as a missioner but also working as a painter for the Qianlong Emperor and in 1752 wrote a letter (that was then published in Europe) describing the most stunning garden of China: Yuanmingyuan, or Garden of Perfect Brightness. Attiret himself, together with an Italian artist named Giuseppe Castiglione, and Michel Benoit (both Jesuits like Attiret), worked to design and build the garden. The curious thing, and the reason why I decided to write something about it, is that Yuanmingyuan unfortunately doesn’t exist anymore. It was destroyed in 1860, and remains the only Oriental garden containing a small European-style garden. It might seem like a vicious circle: who is copying who? and why? The truth is that in many ways oriental gardens influenced european ones, while the opposite never happened. Western buildings in Yuanmingyuan can be considered just as fancy as the Emperor, but never influenced Chinese architecture. European garden in Yuanmingyuan is a kind of a rococò garden, coming from Castiglione’s studies on Italian villas. Buildings are symmetrical, formal, massive, and so is the composition of the garden, far removed from what was happening in those years in Europe. The focal point is a big maze and several fountains are positioned in key points on orthogonal axes. Emperor Qianlong was a collector of European art, and for this reason he often asked for the cooperation of Jesuit missioners, especially Castiglione, who soon became a well-known artist in China, being able to combine traditional Chinese art with modern european techniques. In Italy he had studied also as a stage designer and in China he wrote the first essay on perspective in 1729. We know something about this place thanks to forty copper plates that are now in Paris, that show different views of Yuanmingyuan. A few of them were published by Le Rouge in the books mentioned above. 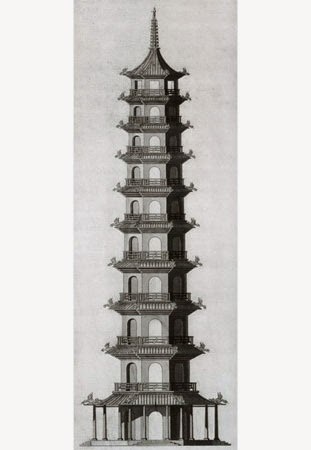 The European buildings are shown in a suite of twenty engravings commissioned by Qianlong in 1784. On the following links you can see recent extraordinary studies that reconstruct Western Buildings of Yuanmingyuan in 3D, plans, elevations and even videos. A wonderful way to learn more about the past using the newest innovations. Thomas, Greg M. Yuanming Yuan/Versailles: Intercultural interactions between Chinese and European Palace Cultures. In: Art History vol 32. Oxford, 2009. Wong, tsu-Young. A Paradise Lost: The Imperial Garden Yuanming Yuan. University of Hawai'i Press, 2001. Zoratto, Bruno. Giuseppe Castiglione. Pittore italiano alla corte imperiale cinese. Brindisi: Schena editore, 1994.